We’ve all been visited by the spirit of creativity. A flash of inspiration causes you to compose a new song, paint trailing vines on the kitchen furniture, or write an article that eloquently expresses some of the ideas that float through your imagination. It’s a marvelous feeling when the muses of creativity grant you their gifts. But sometimes you have to work to seek inspiration and try to harness your creative power. Difficult though that often proves, you can use liminal dreaming to woo your muse. Liminal dreaming occurs at the boundary between sleep and waking. When we talk about dreams, we usually refer to the REM (rapid eye movement) dreams that mostly happen during the second part of the night. There are actually several different types of dreams that correspond to stages of sleep. The two stages of brainwave activity that make up liminal dreaming are called hypnagogia and hypnopompia. 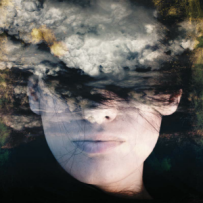 These are the phases of consciousness you pass through when you’re falling asleep or waking up, and they are very unusual states of mind – especially hypnagogia, which is easier to access – to jump start the creative process.